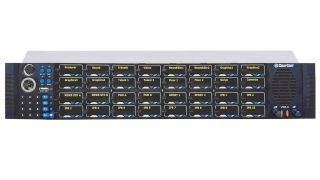 The What: Clear-Com’s V-Series Iris Panels, which provide Eclipse HX users with low latency audio over IP (AoIP) using AES67, are now shipping. The What Else: The V-Series Iris panel can monitor and send communications over three concurrent AES67-compliant uncompressed audio IP streams, enabling systems to deliver high-quality, uncompressed audio from intercom user to user with significantly reduced latency. When connected to Clear-Com’s new high-density E-IPA card, which is natively AES67 compliant, users can deploy up to 64 Iris panels per card. The Iris panel also offers fully user-configurable color OLED displays, providing the user label, tally, and port information. EHX Supervisor Mode real time control allows label updates and monitoring on the fly. In addition, production teams can take advantage of the flexibility offered by combining V-Series Iris panels and multiple E-IPA cards: for example, a large sporting event might use a single frame with many wireless/panel connections on the same intercom network to cover an entire stadium, or megachurches may create multi-region intercom networks via LAN, WAN, or the internet to help broadcast services to churches around the world. The V-series Iris panel is optimized for use with EHX 11.0 software to fully implement its AES67 connectivity, real-time control, and color tallies; it also has I.V. Core IP and four-wire connections for backward compatibility with Eclipse frames running EHX 10.0 or earlier. The Bottom Line: The V-Series Iris panel is well suited for productions that have fully converted to IP-based communications for distribution of video and audio. Live production teams will also benefit from the full-color OLED displays, allowing teams to quickly view and process channel information simply by the colors displayed, keeping their focus on the performance.